Rim CEO confirms another BlackBerry Storm is on the way. | BlackBerry Blast! BlackBerry Blast! > News > Rim CEO confirms another BlackBerry Storm is on the way. Rim CEO confirms another BlackBerry Storm is on the way. 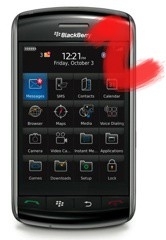 We've heard this news before but RIM is planning a follow up to the successful BlackBerry Storm. Jim Balsillie, RIM co-CEO, told an audience of analysts, "We see this very large and untapped consumer market." Balsillie went on to say Storm sales are strong and then added "we have next-generation devices with that and the whole roadmap." He did not give specific details but it seems obvious that another BlackBerry Storm is on the way.